Water Well Questions and Answers - EADES WELL DRILLING INC.
Q) I need a new drilled water well. Can you help me out ? A) EADES WELL DRILLING will vis­it a site for free to assess the poten­tial for drilling a well. We will be hap­py to assist you in mak­ing the best deci­sion for you with mul­ti­ple options. Q) How do you know when you’ve hit water ? A) Drilling for water can be likened to hunt­ing. The driller is look­ing for “sign”. In this case, clean sand or grav­el that may be water-bear­ing in the over­bur­den or soft spots in the bedrock that may indi­cate cracks and crevices that can yield water. Care­ful obser­va­tions and mate­r­i­al sam­pling by the driller are required for the best result. Q) How do you know where to drill ? A) The Min­istry of the Envi­ron­ment has min­i­mum set­backs for water wells from any poten­tial source of con­t­a­m­i­na­tion. For a drilled well it is 50 ft, for a dug/​bored well it is 100 ft. Main­ly the con­cern on a rur­al prop­er­ty is any part of the sep­tic sys­tem. Oth­er con­t­a­m­i­na­tion con­cerns may be roads (salt), above ground fuel tanks, grey water dis­charge, garages and park­ing areas. Q) What about Agri­cul­tur­al Water Wells ? A) For a farm sit­u­a­tion there are many more. In addi­tion to these set­backs, the well must be locat­ed in a place that can be accessed in the future for main­te­nance and repair. It can’t be under over­head pow­er lines (of course) or trees, and often locates for under­ground util­i­ties must be under­tak­en to ensure all is clear for the bore-hole. Q) What about drilling for water in low yield areas ? A) If we are going to drill in an area where I believe that the chances of get­ting a decent flow are slim, will tell the client that in advance and make my terms clear to them. Q) How do you know where there is water ? A) The under­ly­ing prob­lem with my trade is the impli­ca­tion that I have some kind of con­trol over strik­ing water but the real­i­ty is that I do not. Witch­ing is fine and well but it is no guar­an­tee. I can guar­an­tee that we will drill a straight and plumb bore-hole and com­ply with all the MOE rules and reg­u­la­tions but I can­not guar­an­tee water. Q) Where did the rust come from ? A) Rust col­or indi­cates Iron or Iron bac­te­ria. Both very com­mon and very nor­mal in ground­wa­ter. It can be treat­ed in-house. Q) Water from the tap smells like rot­ten eggs. What do I do ? A) Sul­phur is also com­mon in bedrock aquifers. It can be treat­ed as well. 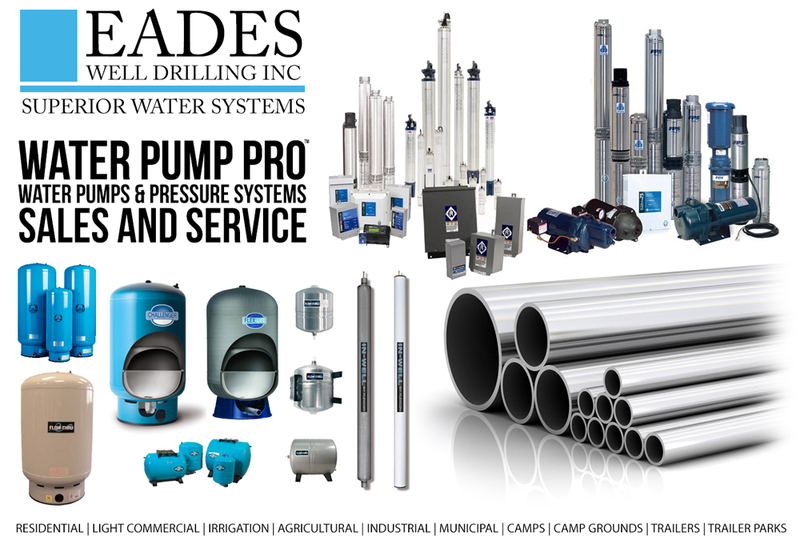 EADES WELL DRILLING have what you need to solve your prob­lem. Q) Water from the tap has a milky colour. Why is it cloudy ? A) If it is cloudy then some­thing is not right. It is our man­date to pro­vide water that is clear. Cloudi­ness indi­cates the pres­ence of silt and/​or sus­pend­ed par­ti­cles that can clog fil­ters very quick­ly. Q) How deep does my well need to be ? A) I gen­er­al­ly pro­vide a range of expect­ed depths to a client based on com­pa­ra­ble wells in the area but noth­ing is fast and firm in this trade. Con­di­tions under­ground can change quick­ly so if there is a range of depths in a giv­en area which may neces­si­tate a deep­er well. Q) What will the water flow be like ? A) Ulti­mate­ly you don’t know this for sure until the well is com­plet­ed, devel­oped and test pumped. Com­par­i­son to wells in the area can sug­gest a range but until it’s in, we don’t know. Q) What is the min­i­mum flow rate ? A) There are sug­gest­ed min­i­mum flow rates for domes­tic house­hold use and some banks will want to see a min­i­mum flow rate to pro­vide a mort­gage. It ranges from 3 to 5 gal­lons per minute. Q) Can I fill my pool from my well ? A) If your well is capa­ble of sus­tained pump­ing for that long then you could. That being said, how­ev­er, it is rec­om­mend­ed to use munic­i­pal water to fill your swim­ming pools and or hot tub because it is already chlo­ri­nat­ed and won’t have any min­er­als or bac­te­ri­o­log­i­cal issues that may affect the colour and/​or PH of the pool water. Q) Can I use auto­mat­ic land­scape water sprin­kler sys­tems ? Q) Can my well water be 10,000 years old ? A) Deep drilled wells are usu­al­ly tap­ping into an aquifer that was deposit­ed there dur­ing the glacia­tion of this area approx­i­mate­ly 10 000 years ago. This water is unaf­fect­ed by sea­son­al rain­falls and sur­face water so there is no change to flow rates. If you well is quite shal­low how­ev­er, it might not be. Q) Can earth quakes felt in Ontario affect my well ? A) Yes, an earth quake can have an effect on a well depend­ing on the sever­i­ty. Moment of tec­ton­ic plates cre­ate earth­quakes. Q) Is it true the earths crust moves under our feet ? A) It is true, tec­ton­ic plates move about 7.5 cm a year. Moment of the tec­ton­ic plate may affect sub­ter­ranean water flow.